Did you know that one wigwam of Sweet Peas will give you a bunch of flowers every day? All you have to do is remember to pick them regularly to prevent the plants setting seed. They are one of the most beautiful scented productive flowers I know and well worth growing. Each year I grow a few new varieties to see which I like best of all. This year I’m also growing Sweet Peas from seed I collected from my own garden last year. At the end of the season I left the last few flowers on the plants to form seed pods. When the seeds pods were crispy and dry and the ripe seeds rattled in their cases I collected them. The hard round brown seeds were stored in small paper packets to keep them cool and dry over winter. In spring I sowed them two to a pot in the greenhouse then planted them out in May. It’s quite exciting waiting for them to flower because they won’t be exactly like their parents. Sweet Peas are climbers. You may prefer to grow them on their own in straight rows supported by pea and bean netting. I like to grow them mixed in with other plants such as herbs and vegetables. I make wigwams from study poles with green twine woven between them. Sweet Peas have tendrils to help them climb but I’ve found that they do best if I tie them onto their support as they produce new growth. 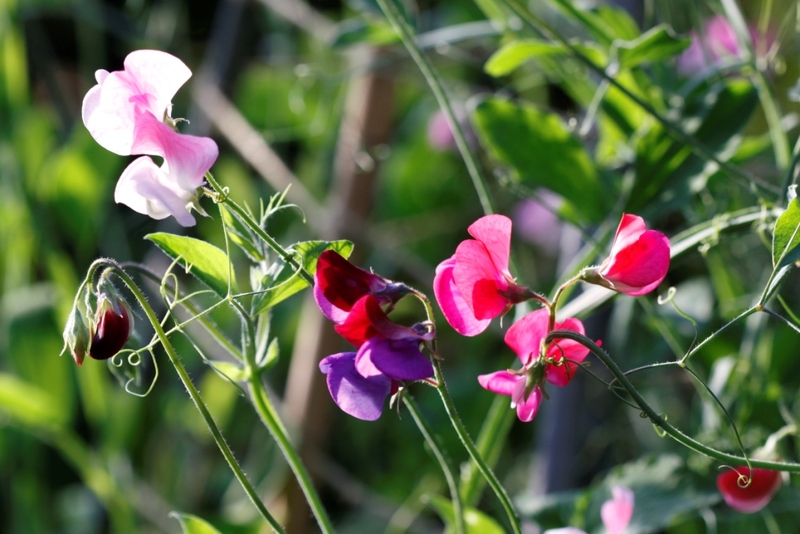 Are you growing Sweet Peas this year?